Everybody's been to Greenies, and more recently The Cannery. Both are fabulous builds that you just want to keep going back to. 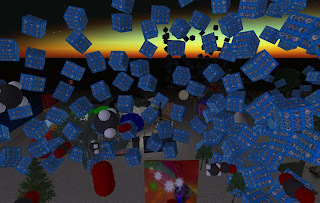 I wondered who made them, and found an elusive organization known as Rezzable. I am not exactly sure what they do, other than build wonderful sims, but I really appreciate their work. 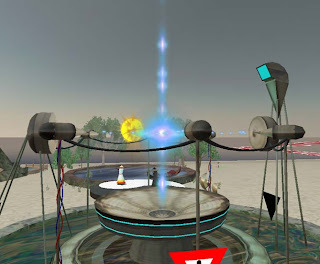 Meanwhile, my interest in exploring led me to investigate Rezzable more directly - and I discovered that Rezzable seems to own quite a complex of islands, including The Cannery and the original Greenies. Why so many islands? Perhaps other things are under construction? I just had to look. This appears to be a gigantic Philodendron... suggesting another "Land of the Giants" / Greenies area? 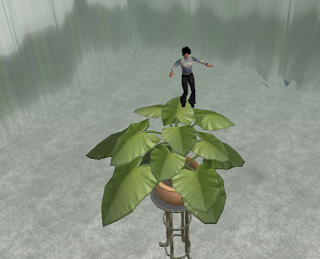 The tree-sized plant is housed in a massive planter far below me. In the vicinity were other rather large items suggesting that a large-scale build is underway. Why another Greenies? I can only speculate that Rezzable believes that anyone going to Greenies would likely also go to the new sim. Double the sims, double the traffic? I will definitely visit the unnamed area again once it is open. 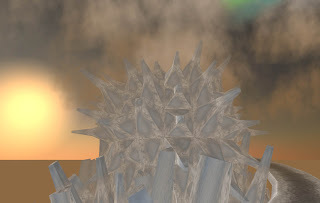 In a completely different sim, Rezzable seems to be working on a massive ice-world. It is completely shrouded in ice and fog with walls and towers of pure ice everywhere. This area is much more complete than other areas I visited. 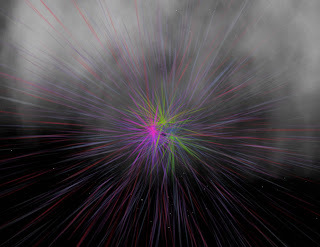 Here we see a towering ice mountain that dominates the central portion of the sim. 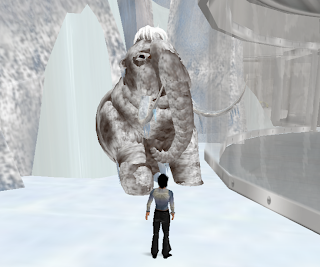 I managed to get close to a very special item, reminiscent of the famous Greenie's cat - perhaps the first Woolly Mammoth in SL! By the way, the Greenie's cat turns out to be an incredible place for impromptu dance parties. I wish someone would build a club where you can sit or dance on large structures, animal or otherwise. 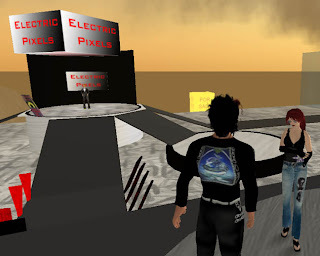 Alas, most clubs in our virtual world lack imagination and simply reproduce real-life analog clubs.... sigh. This problem is, I think, another indication of the widespread lack of imagination of many builders. 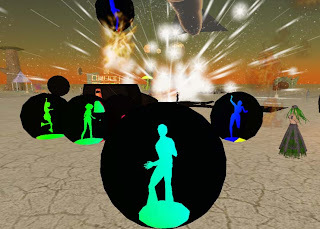 Second Life is virtual - things do not always have to correspond to real life! 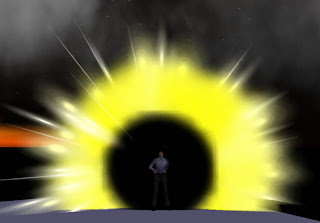 While many complain of restrictions, policies and bugs in Second Life, I still think the major barrier is our imaginations. Another area is apparently the beginning of a massive underwater fantasy. 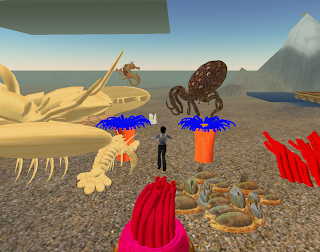 Of course, the items are all larger than life, particulary the as-yet-untextured wooden Lobster beside the anemones and octopus. Rezzable likes them big! These guys seem to be marshaled in an area and have yet to be placed in their final positions. 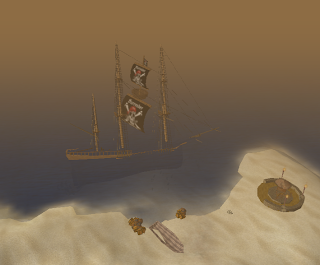 Nearby there is what appears to be a sunken pirate ship and beach area. No one but Rezzable knows what these areas will turn into, but my guess is that they will meet the incredible build standards already established at Greenie's and The Cannery. 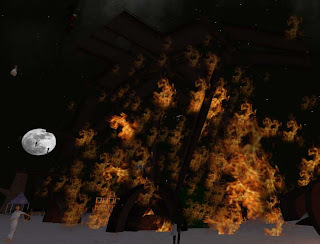 Good work, Rezzable - who ever you are. 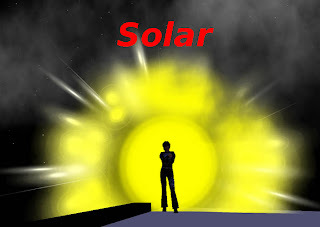 Five new products are available at Electric Pixels this week. Eu sou Brasiliero! (with much help from CRISTIANE Repine) and Ich bin Deutschländer, two national poofers. 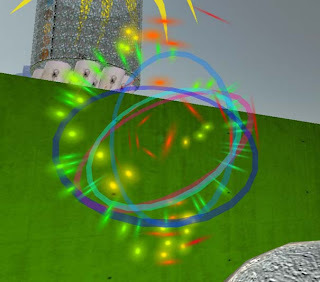 The two new national effects are accompanied by ring versions, Anel de Brasil and deutscher Ring (thanks, MythX Hax) and join the growing collection of national particle effects. 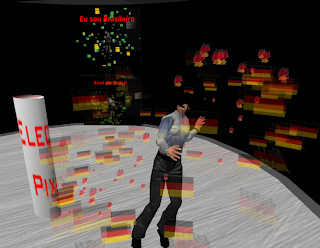 In this image I am testing the deutscher Ring effect at Electric Pixels. If you have any comments about these products, please add them here. 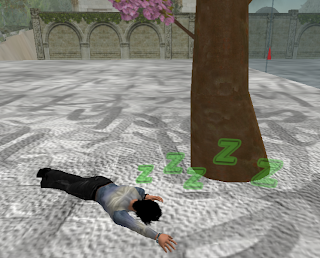 After looking at Linden Lab's recent usage statistics, I am thinking of building effects for France and UK next. Would anyone like to assist me?